This procedure defines the requirements for documenting quality assurance activities at Organization locations and for preparing and submitting quarterly quality assurance reports that contain an overview of quality assurance activities that occurred in each quarter. Introduction to quality assurance report? Quarters are based on period calendar periods Quarterly quality assurance reports shall be prepared by the Facility, resources, Laboratory, Inspection Manager or their designee on quality assurance activities at their assigned location and submitted to the Corporate Quality Assurance Department. Quarterly quality assurance reports are used by the quality assurance Department to oversee quality assurance activities at each location, assist locations as indicated, communicate any items of concern to the appropriate Area Manager, and prepare annual quality assurance Performance Status Reports. 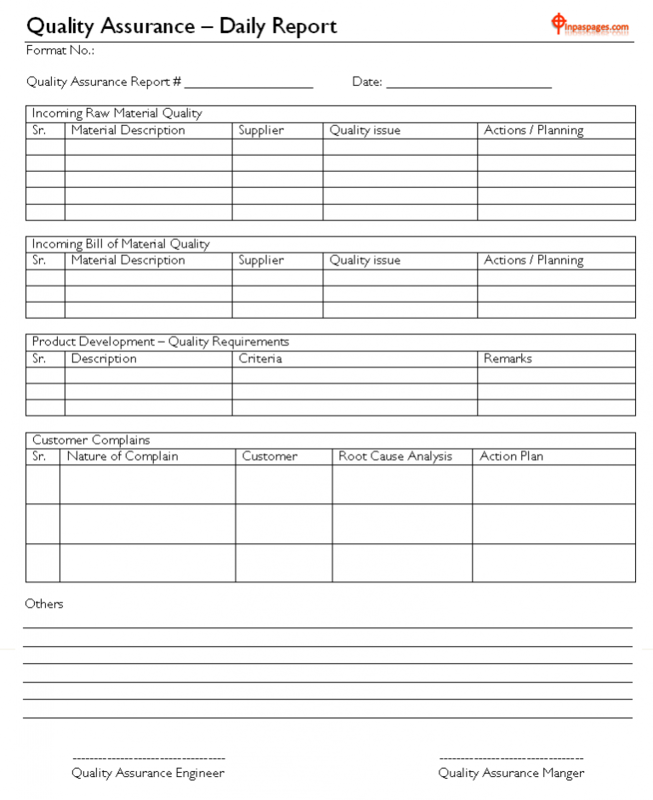 How to prepare quality assurance report template? The Facility, Laboratory, Inspection Manager or their designee is responsible for compiling and maintaining all documentation related to quality assurance activities at their location(s), preparing a quarterly quality assurance Report, and submitting these reports to the quality control Department by the required due date. The Inspection/Facility Manager or their designee is responsible for performing field audit twice per year per inspector. This should cover loading or discharge operations performed by each inspector assigned to their location. The quality control Department is responsible for reviewing quarterly quality assurance Reports, providing feedback as needed to each location and communicating any issues of concern to management and/or person submitting the report and preparing annual quality assurance Performance Status Reports. Prepare quarterly quality assurance Reports for quality assurance activities performed in each quarter of the year (reporting period). Submit the report to the quality control Department by the half of month the subsequent month, as shown by the schedule in defined frequency. Report only those activities that occur during the reporting period quarter. Why quality assurance report is important? For locations with satellite offices, report details of those offices and indicate the location. Complete the Quarterly quality assurance Report and include any applicable forms and records listed in specified field Report any other quality assurance activities as appropriate. Maintain each section of the quality assurance Report form continuously through the year. Do not restart each quarter; instead, add to or update existing entries each quarter. Report information pertaining to the following sections of the quality assurance Report form and include described documentation as applicable. Document customer compliments and complaints on the Client Contact Report. Encourage all departments and personnel to obtain feedback from clients, including scheduling/shipping/login, accounts receivable, field services, etc. For customer complaints, also complete a Corrective & Preventive Action Report and take appropriate action. Inspection, lab or both, complaint category or description, and status of completed corrective action & preventive actions. During an external audit/visit, take notes and submit in the quality assurance Report with completed an External Audit Corrective Action Response for any findings. How to review quality assurance report? The status of response to organization/auditor. Corrective action taken for any audits with a score below 60%. Submission of supporting documentation is not required. Document field audits conducted by the Location/Inspection Manager or their designee on the Inspector Audit Checklist including the name of the inspector, location, job site or vessel, auditor, audit date, and scores for each question. If any questions are not applicable, mark N/A on the checklist and do not include in the possible score or actual score. Maintain completed checklists in a file and provide for review during internal audits. Document inspector audit activities in the Inspector Audit Log section of the quality assurance Report form.